Google’s voice-imbued home speaker named Google Home has become the important part of modern homes. Its amazing features have made more and more number of people fall in love with the unit. However, it comes with one drawback. It only listens to one person’s commands. Not any more! Yes, you heard me correct. This aspect of Google Home which many people like me didn’t love about it has a revolutionary change. Now, Google home will listen to not two or three instead six people’s commands. Google has announced the multi-user support for Google Home and the credit goes to powerful machine-learning algorithm and upgraded smartphone app. There is a specialized form of artificial intelligence, neural network that analyzes the spoken phrases and compares the sound of your voice to previous analyses. As mentioned earlier, Google brought this feature recently to Google Home, many people don’t know how to use it. 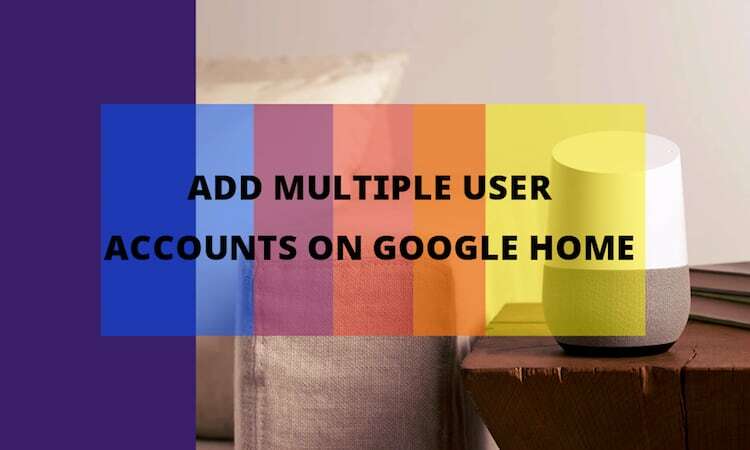 This is the reason, we have created this tutorial that will help you to add multiple user accounts on Google Home. It’s not that hard as you think. Just follow the steps below. If you bought Google Home just recently and are unboxing it, then you should be wondering how to setup Google Home for the first time. Please check the instructions below and if you have already done it, you can skip this section and follow the steps on how to add multiple user accounts on Google Home. Download the Google Home app from the Google Play Store or Apple’s App Store. Connect to your home Wi-Fi network. Sign in with your Google account. There is an icon on the upper right-hand corner which you need to tap to sign in. List down your local weather and commute time preferences. To link your streaming music accounts go to Music tab in the left-hand slide-out menu and tap the link button. Make change to the news sources to get the updates. Also, you can link your smart home appliances like Philips Hue bulbs and log into services like Lyft and Uber. Set your home and office locations, enter complete addresses to get real-time traffic updates. Besides, you can also change the way Google Home addresses you by adding nickname in the Personal Info tab. Let’s talk about how to add multiple users in Google Home! To add multiple user accounts on Google home, you need to open the Google Home app that helps you get this task done. You’ll come across the card that says multi-user is available. If you don’t see this, simply tap the icon in the top-right to see all of your connected services. Teach the Google Assistant to recognize your voice by repeating short phrases like, ‘OK Google’ and ‘Hey, Google’. Add up to six different accounts (if you want). This is how you can add multiple user accounts on Google Home. Didn’t I said it was very easy. What do you think? Now, when you say, ‘Hey, Google’, the Google Home will analyze your speech patterns and respond accordingly. You’ll get your music, your commute information, your daily brief (whatever you request).